Childhood depression isn't on many parents' radar and can be easy to miss. (Parenting.com) -- My daughter Rachel is sitting silently ten feet away from me, stroking our cat. It's a hot summer day and nearby her siblings are all splashing in our new pool. Why isn't my 11-year-old with them? Because she suffers from clinical depression, and she isn't having one of her better days. I first noticed Rachel's symptoms when she was 6. She started clinging to me more than usual, crying at the smallest provocation, eating less, and having nightmares. She seemed anxious. After several weeks, the situation seemed to resolve on its own, but, having been through depression several times myself, I was on the watch for other signs. Symptoms showed up again two years later, at the end of a long winter. Rachel, by then a third-grader, started telling me that everybody picked on her (though this didn't actually seem true), and that she wished she had never been born. That last, increasingly frequent comment scared me, but I decided to give her a few weeks to see if it would pass. It didn't. Her mood became worse and her grades began to slip. I could see that she was suffering terribly. I wanted to hold her and tell her it would be all right. I wanted to vacuum out of her the empty, deceiving emotions that I knew were skewing her reality into despair. We made an appointment to see the pediatrician, and it was obvious from Rachel's eager anticipation that she hoped someone could help her. Though I wasn't surprised at her diagnosis, I was surprised by how overwhelmed I felt by it. I couldn't think of any other parent grappling with this. And I ached knowing that my little girl had to deal with something so much bigger than she was. Since that day, I've learned a lot about childhood depression -- including the fact that ours is far from the only family affected. If you think you may be seeing the illness in your child, read further for what you need to know. It's more common than you think. Depression isn't normally an illness that we associate with kids, but it should be, says Robert L. Hendren, D.O., past president of the American Academy of Child and Adolescent Psychiatry (AACAP). 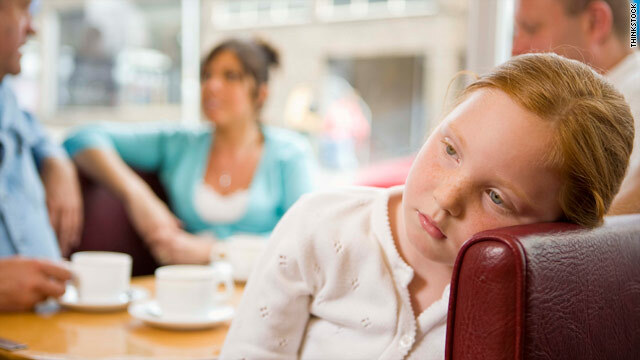 The AACAP estimates that as many as one in 20 children and adolescents is depressed. "Another way to think about it is that, on average, at least one child in every classroom will have it," says Dr. David Fassler, M.D., co-author of "'Help Me, I'm Sad': Recognizing, Treating and Preventing Childhood and Adolescent Depression." The catch is knowing when a child is more than simply unhappy. "Normal sadness comes and goes and usually clearly relates to an incident," says Dr. Hendren, who is also director of child and adolescent psychiatry at the University of California, San Francisco. "Clinical depression is like a dark cloud hanging over the child, and there's often a pervasive feeling of gloom, irritability, and loss of interest." Since childhood depression isn't on many parents' radar (and sometimes not on doctors', either), it can be easy to miss. Sally Davis's* son Richard* saw counselors from age 6. But, says the Brockville, Ontario, mom, "the psychologists refused to consider depression because they felt that children that young didn't get depressed." As a result, Richard wasn't given that diagnosis until seven long years later. Being the parent of a depressed child is not easy. As Ann Slater*, a Columbus, Ohio mom whose daughter was diagnosed at age 8, puts it, "It's heartbreaking and scary. Like any other serious medical condition, it consumes your time and thoughts as a parent. Then there's the guilt: Maybe I could have done something differently." Dr. Fassler, who's a clinical professor of psychiatry at the University of Vermont, says parents have no reason to blame themselves. "Depression is no more the result of 'bad parenting' than is diabetes or cancer," he says. "All are real illnesses that require careful evaluation and appropriate treatment. The good news is that we can help most children and adolescents." Depression can run in the family. Studies show that 25 percent of kids who have a parent who has suffered from clinical depression will experience their own episode, says Fassler. If both Mom and Dad are depressed, the risk increases to around 75 percent. Scientists aren't exactly sure of the reason for this, but one theory posits that these kids have a genetic vulnerability, which is then exacerbated by a stressful environment. That said, keep in mind that genes aren't destiny, even when there's depression in the family: Rachel's siblings, for example, so far seem untouched by the disease. It's often masked or mimicked by other problems. "Approximately forty percent of children and adolescents with depression also have an anxiety disorder, such as obsessive-compulsive disorder (OCD), and about one in four has attention deficit hyperactivity disorder (ADHD)," says Fassler. Learning disorders are also common. Experts don't know quite how these relate to each other, but they do know that when there are coexisting conditions, it can be harder to suss out and treat each one: Symptoms can overlap, making the conditions harder to identify, or medication may not be as effective. That's why some mental health professionals suggest that every child diagnosed with depression be evaluated for the other disorders, and vice versa. Irritability can be a major clue. The biggest difference between symptoms of adults and those of children is that while adults are usually sad and withdrawn, children are easily aggravated and may have irrational outbursts, says Hendren. "Children might not recognize that they are feeling depressed," he says. "Often, they don't know how to identify this feeling and put it into words." Kate Coyne*, a mom from South Portland, Maine, initially took her daughter, Emma*, then 8, to a psychologist after a teacher said she'd been "uncharacteristically irritable" at school. "I was shocked when the psychologist said she was depressed," says Coyne. "Since Emma wasn't withdrawing or sleeping all the time -- symptoms that might have jumped out at me -- it never entered my head." Early diagnosis and treatment is key. MRI studies have shown that prolonged untreated depression can actually change the shape of the brain. It may, for example, shrink the hippocampus, which helps regulate emotions. No surprise, then, that depression can contribute to problems in school, substance abuse, and, in the most serious cases, even self-harm and suicide when help is delayed. The bottom line: If you suspect your kid is depressed, get him to the doctor as soon as possible. "If Richard had been diagnosed properly, we could have been working on giving him his coping strategies when he was six, instead of waiting until he was in the pit of hell at thirteen," says Davis of her son, whose suicidal tendencies, recurrent depressive episodes and serious sleep difficulties are all consistent with untreated depression. "I definitely feel that the amount of time between his first diagnosis and the right diagnosis contributed to the severity of his depression." The treatments for childhood depression are more complex than for adults. Doctors use the same basic set of tools in ministering to both age groups: everything from lifestyle changes (getting more exercise, eating better) to cognitive behavior therapy, which focuses on developing realistic, practical ways to cope with depression-distorted thoughts and reactions. "In particular, research suggests that many children and adolescents with milder cases respond well to psychotherapy," Fassler says. However, depending on how severe the depression is and how long it has been going on, medication may be necessary as well. This was the case for Damon Reinhardt, 9, of Vancouver, Washington. "He was never a happy-go-lucky child," says his mother, Melissa Hansen. "You would look at him and he just looked like a sad little boy." But after the death of his father 15 months ago, not long after his parents had split up, things got much worse: He spiraled into a depression so deep that his mother had him spend a week in the hospital. Eventually, his doctors put him on the antidepressant Celexa, and an antipsychotic, Abilify. "The counseling and medications were the best decision I could have made for him, for both of us," says Hansen. "He still has lots of ups and downs, but he can laugh and play now. It's amazing to see how much difference it makes for him." Of course, most parents have heard of the warning from the Food and Drug Administration (FDA) about the risk of increased suicidal tendencies in children and adolescents using antidepressants. Yet it's important to know that all the major medical groups have come out in favor of using them in at least some situations, in conjunction with other treatments. "Medication alone is rarely a sufficient intervention," Fassler points out. "It should only be used as one of the components of a comprehensive, individualized treatment plan." In Rachel's case, the doctor recommended therapy, coupled with a low dose of Prozac. I was hesitant to put her on medication but ultimately decided that I wanted her to have relief as soon as possible. Today she sees a therapist who specializes in treating children, as well as a pediatric psychiatrist. And it's worked well for us. Her doctor plans to wean her off of medication soon to see how she does. I do worry about what will happen with her depression when she hits adolescence, but I'm glad we've got a handle on it now and that we have an idea of what to expect. Most of all, I'm happy that for every stormy day, there are now dozens when she walks in the sun. Depression can be triggered by events such as moving, changing schools, divorce or medical illness -- but other times it seems to hit for no reason at all. Sarah E. Ludwig is a freelance writer and mom of four living in South Dakota. This is her first piece for Parenting.